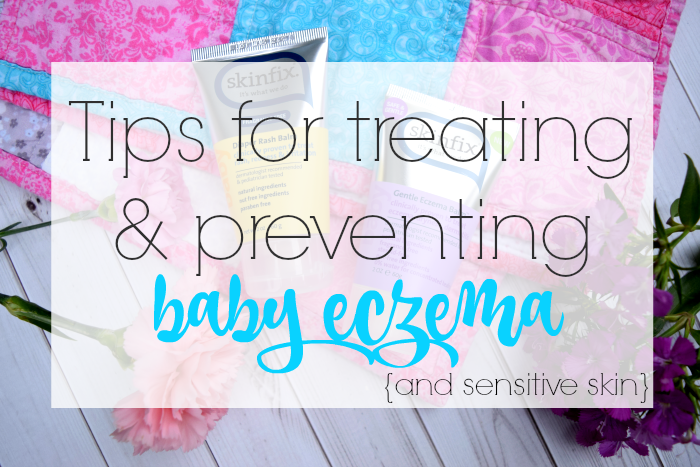 When I first became a mom I had no idea that I would soon be an expert on eczema and sensitive skin. My skin has always been pretty normal and I've never suffered from overly dry, sensitive skin, rashes, or eczema, so it wasn't even a thought in my mind when I started having kids. But then my first child was born in September of 2004, and by the time he was two months old I quickly realized he had insanely sensitive skin. It was always dry and peeling, and he was covered in bright red, scaly patches- mostly on his cheeks and in the crooks of his elbows and knees. The poor little guy always had bloody scratches all over his face and arms from itching himself constantly. I felt so bad and didn't know what to do! I tried all of the lotions and creams I could get my hands on and I read everything I could on sensitive skin and eczema. After months of trial and error, we were finally able to get his skin under control. I had to be so careful about everything that came into contact with my little man's skin! Fast-forward 12 years, and now I've got two more kids with extremely sensitive skin and one more on the way (who will most likely follow suit, I'm sure). I've learned a lot about how to take care of sensitive skin and how to keep eczema flare ups at bay, and today I'm sharing that advice! Bath time 101. One of the biggest lessons I learned was that babies and toddlers with sensitive skin and/or eczema should not be bathed every single day. It's just far too drying for their skin! I usually aim for every 3 days or so (or as needed), but definitely not every night. Babies really don't get that dirty- they're not playing outside or getting messy during playtime, so skip the bath unless it's really necessary. When it is time for a bath, make sure the water isn't too hot. Hot water is extremely drying. Also, make sure you're using shampoo and body wash specifically designed for sensitive skin. Skinfix's Gentle Hair and Body Wash is perfect for dry, eczema-prone skin. It's fragrance-free, sulfate-free, and paraben-free, making it the perfect 2-in-1 bath time wash that won't strip away the skin's natural moisture or irritate your baby's delicate skin. After bathing, make sure to moisturize immediately with a fragrance-free moisturizer, like Skinfix's Gentle Lotion or Gentle Eczema Balm. The Gentle Lotion is a great, lightweight, everyday moisturizer, while the Gentle Eczema Balm is perfect for extra-dry skin and eczema flare ups. Both are also fragrance-free! When my baby has an active eczema flare up, I like to slather the balm on her skin at bedtime to help moisturize all night long. Dress appropriately. Babies with sensitive skin and eczema need to be dressed appropriately, meaning you should try to opt for natural fibers and cotton blends to avoid irritation and excessive sweating. Also, skip the fancy, overly-perfumed laundry detergents and fabric softeners, and opt for something gentler and free of dyes and perfumes that won't irritate your baby's skin. Diet is important. Certain foods can trigger eczema and sensitive skin, so watch what your baby/toddler eats and take note of any reactions he/she might have. Foods like cow's milk, eggs, and nuts are pretty commonly problematic for eczema sufferers (though that's not always the case) so be careful when introducing new foods to your little one. If you're breastfeeding, you may have to avoid certain foods as well. When in doubt, consult your doctor. Adjust your diaper routine. Certain diapers may cause your baby's sensitive skin to breakout or become prone to rashes, so sometimes finding the right diaper can be a challenge. You might have to try a few different brands before you find one that works for your baby. Make sure to change him or her frequently, and slather their little bums in a good diaper rash cream to create a barrier between their skin and any wetness it comes in contact with. Skinfix's Diaper Rash Balm is clinically proven to treat and prevent diaper rashes, redness, and irritation while using natural ingredients. This balm is super rich and helps replenish essential moisture to your baby's skin with emollient protective oils. I like to spread on a thick layer of it especially before bedtime to protect my little one's skin all night! 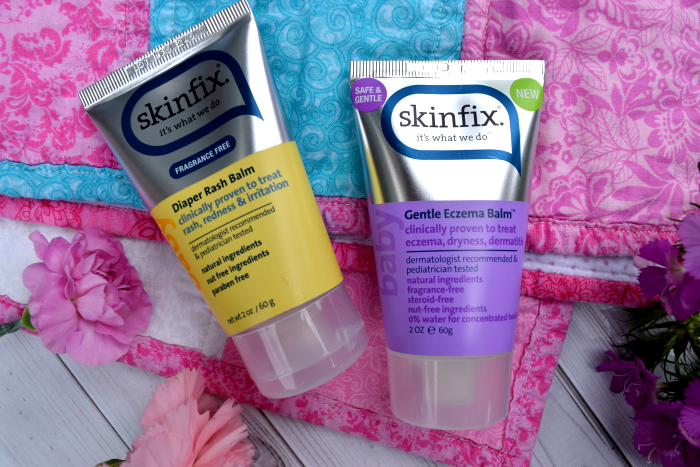 Skinfix products are available only at select CVS and Target stores- both online and in-store. Find out if your local store carries these great products here! Have your little ones ever suffered from eczema or overly sensitive skin? I'd love to hear your best tips and favorite products!